The idea here is to work on co-ordination between left and right hands, and combining picking and slurring. 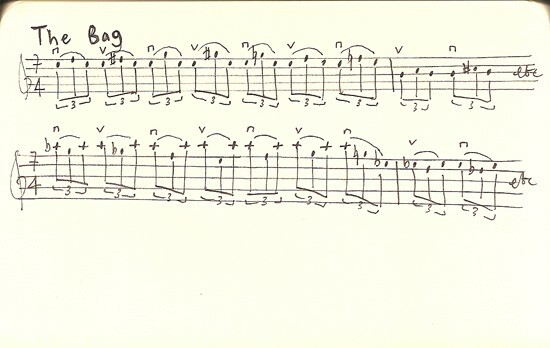 The exercise uses all the left-hand fingers, so in the first exercise the F, F#, G, and G# notes are played with the 1st, 2nd, 3rd, and 4th fingers respectively. Pick each new combination with an alternate stroke. This’ll mean that each time you change string the picking reverses. There are two basic variations. The first uses a lower axis point of an open string. The second uses an upper axis point played with the 4th finger. The second version is much more difficult than the first for two reasons: 1, you’re working the little finger more and it’ll get tired quickly. 2, when you cross the string you have to hammer onto a new string with the little finger, which is a little tricky. I think of it like the boxer’s speed bag. It’s all about timing and co-ordination. So you might want to read a bit about how boxers use the speed bag, and that might give you some ideas for varying this exercise. For example, instead of playing triplets, you could double up the slur and play groups of 5, or triple the slur and play groups of 7.